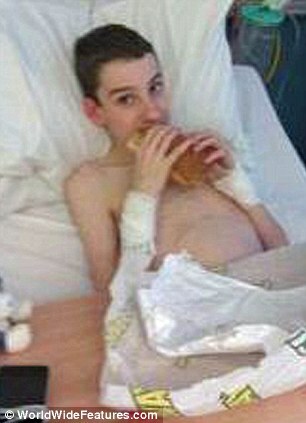 Teenager Harvey Legg has grown an amazing five inches - after a pioneering operation to straighten his spine. Surgeons had never performed the operation on a boy as young as Harvey, but the bend in his spine was so severe that it was crushing his vital organs. Complications from the operation left them fearing he was brain dead after he lost his entire body’s worth of blood and his brain shut down. 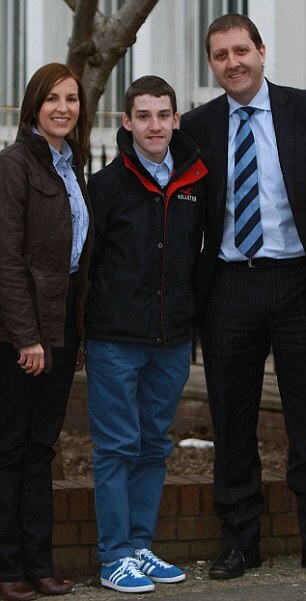 But now he has made a full recovery - and now stands five inches taller thanks to the amazing operation. His mother Claire Walker said: ‘It really is wonderful to see. He now stands as tall as me - he literally grew three inches overnight after the operation once surgeons had straightened out his spine, and then since he has grown a further two inches. 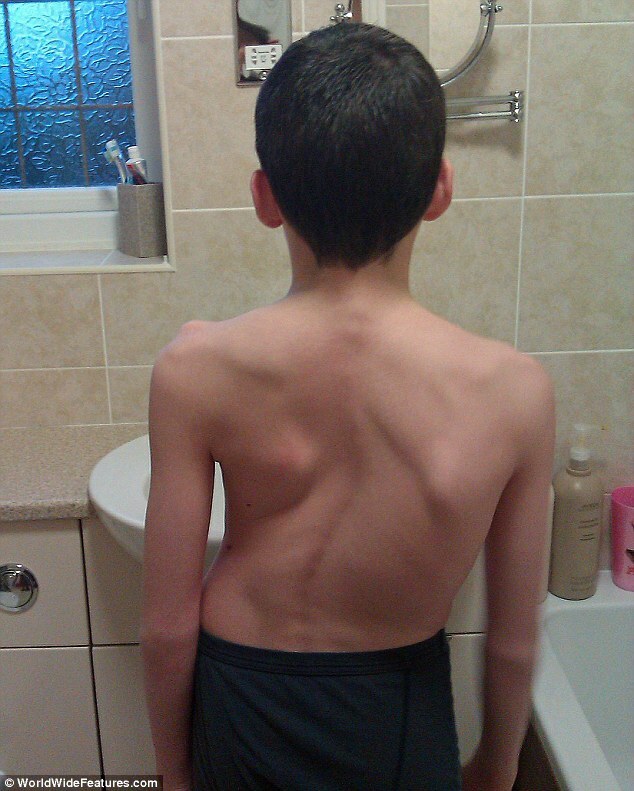 Harvey, now 14, was diagnosed with scoliosis, curvature of the spine, at eight years old, after he bent down to put his socks on and his mother noticed that his rib cage protruded to the right. He was referred to a paediatrician at Sheffield Children’s hospital who said his case was so severe he would have to have surgery. 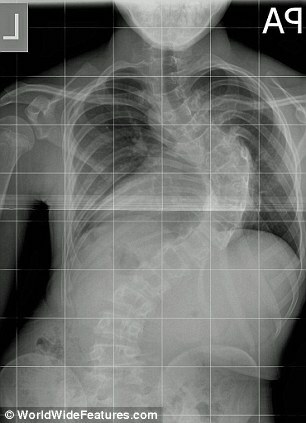 They had wanted to wait until he was late into his teens to carry out the operation when he had finished growing, but his case was so severe that his organs were being crushed by the curve of his spine. Mrs Walker, 39, who lives with husband Steven, 46, in Holton Le Clay, Lincolnshire, said: ‘It was a shock when he was first diagnosed with it. I’d noticed that his rib cage didn’t look level when he bent down, but I had no idea that it was anything as serious as scoliosis. The operation saw him grow five inches overnight, taking him from 4'10" to 5'3". His spine has gone from being at a 90 degree angle, to just a 20 degree angle. ‘When I was told he would have to have surgery to correct it, I was devastated. But I knew that it was the only option for him. Doctors decided that because his case was so severe, they couldn’t wait any longer to operation on him to straighten it out. The operation had never before been done on anyone so young. Mrs Walker said: ‘We knew that he was very young to have this operation and it was nervewracking, but there was no choice. Doctors warned the couple that there was a risk of paralysis with the operation, but they knew it was Harvey’s only chance as he was being suffocated by his own spine. 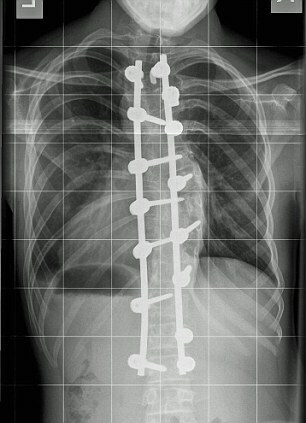 The eight hour operation was carried out in November 2011 at Sheffield Children’s Hospital, where doctors put titanium rods either side of his spine to straighten it. It initially all went well but then complications meant that Harvey lost his entire body’s worth of blood. Mrs Walker said: ‘It was terrifying. We thought we were going to lose him. He had a team of 13 people trying to save him. It was the longest hour of our lives. He had transfusions but then he wouldn’t come round afterwards, which was also really worrying. Harvey spent nine days recovering in hospital, and then a further three months recovering at home. He grew an amazing three inches overnight then a further two inches afterwards, taking him from 4 foot ten, to 5 ft three. 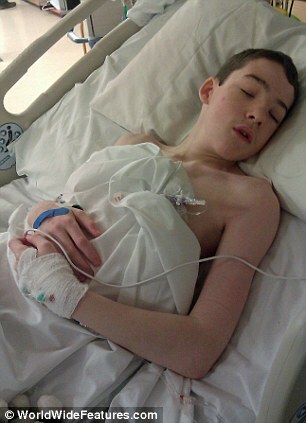 Mrs Walker added: ‘It was so amazing when he stood up and he was so much taller. He had always been the smallest in his class and now he is of average height which is great. It’s like he slept in a grow bag overnight. ‘He can now do contact sports and he can run too. His spine won’t grow any more, but the rest of his body and his legs will carry on growing. It is fantastic that he is now so much taller than he was. Dr Ashley Cole, the consultant spinal surgeon who performed Harvey’s operation said: ‘It was a huge success and Harvey has recovered fantastically well.